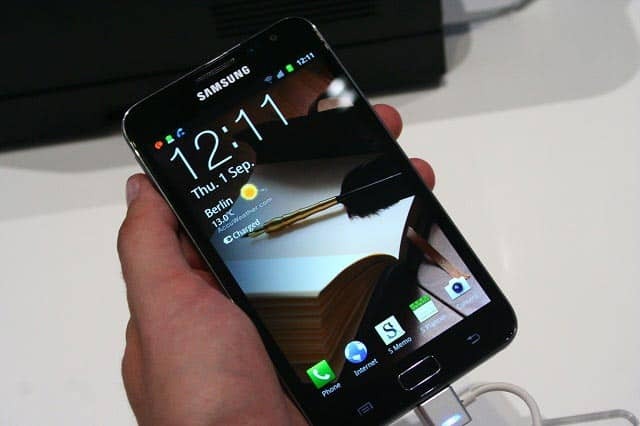 Thinking about your Samsung Galaxy Note 2 home screen, it must be told that you can customize the way you want. You can organize it for a faster access to the applications or contact used frequently. Keep in mind that shortcuts aren’t the same thing with screen widgets because they launch applications. So, you can add a shortcut by tapping Apps from the home screen. You will have to tap and hold the icon of the application that you want to create a shortcut. The shortcut has been created on your home screen and you will release the icon into the place you want. You need to go to the Home screen. Tap and hold an empty area and then tap apps and widgets. Now, you will need to tap and hold the icon and position it on the screen. Release it into the position desired. You will have to tap and hold the shortcut until the edit screen is activated. Now, you will drag the icon to the Remove bar at the top of the creen and release it. Your Samsung Galaxy Note 2 has a favorites tray which can be found at the bottom of the Home screen. There are four spots on this tray and you can customize them the way you want using the same method as one used for creating shortcuts. A widget is the extension of an existing application from your phone. To create a shortcut, you will simply need to tap Apps and then Widgets. Tap and hold the one you want and remove it to the home screen. You just need to tap and hold until the edit screen is activated. Then, you simply drag it to the Remove bar. Tap and hold it for a couple of seconds. Then, you simply release it and you will see a yellow grid on the widget if the widget can be reseized. Now, you simply have to adjust its size. If you want to create a folder, you just simply have to choose the right place and tap and hold it. Then, you will choose Folder option and tap the name you want. Then, tap OK. Tap and hold and empty area from your home screen and then tap Set wallpaper for. Choose from home screen, lock screen or home and lock screens. You can select a picture from Gallery, Live wallpapers, Wallpaper gallery. Select it and tap Done or Set wallpaper. Tap Menu and Edit page from one of your five home screens. Tap and hold the home screen you want to move and drag it to the location where you want to move it and release. You can have from seven to one home screens on your Samsung Galaxy Note 2. You can add or delete them any time you want. If you want to delete one, you will need to go to Menu and Edit page. You will tap and drag it to the remove bar placed to the bottom of the screen. If you want to add one, tap Menu and Edit page. Tap Add Home screen and drag it to the place you want.